The new update allows player discovers Ditto and gain double experience every successful catching a Pokemon. Ditto, the highly awaited Pokemon is finally available to be fill in your bag and registered in your Pokedex. Ditto can disguise it self to a Pidgey, Magikarp, Ratata and Zubat according to player comments all over the world. 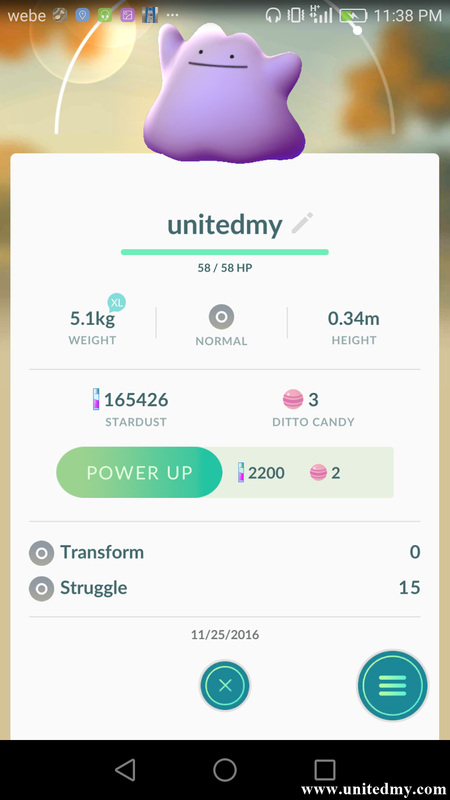 My title fully explained how I got my first Ditto. With additional experience points on Thanksgiving, large number of players returned to their favorite place to catch Pokemon. Pokemon Go's most anticipated Christmas event will be as grand as Santa Claus giving out presents for Pokemon fans. Rumors that either one of them is rollin out second generation of Pokemon or Mewtwo and Mew. Are you still remember the video clip Mewtwo were being seen at a busy shopping district ? It could implying that people were there to a new year eve countdown or even the Christmas eve. That is strange. You know, there is no pokemon like that. Well, I can't remember anything like that.